How does High Performance Team come about? Companies and leaders are faced with a fast-changing economy and competitive landscape especially so with the advancement of technology. Coupled with a younger and more dynamic workforce, many leaders face challenges in motivating and getting the best out of their employees, to compete effectively in the marketplace. Hence, Coaching employees for peak performance, growth and innovation have become one of the most important leadership skill to master. Facilitating leaders to engage high performance team involves understanding the key characteristics of team performance, a mindset shift and the required skillsets. These skills are useful in many situations such as motivating employees to higher achievements, drawing out the creativity in employees, discussions on developmental requirements, overcoming challenges, performance management and performance appraisal. 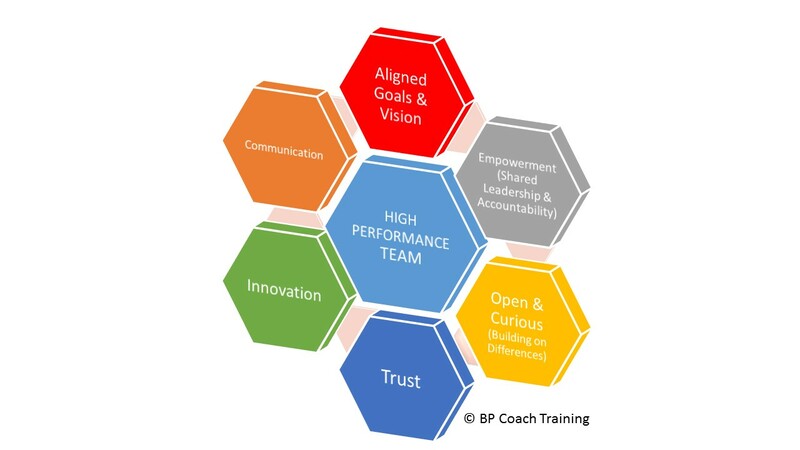 There are a number of characteristics of a high performance team as shown in the diagram. Understanding and enabling the team to achieve these are critical in driving the performance required. Below are the course outline for the workshop. Our Training is designed based on Adult learning principles and hence, emphasizes on experiential learning activities, small group and class interactions as well as skills-based practices during the workshop. This methodology accelerates adult learning, retention and brings forth the application/relevance to real-life situations. Equally important, the workshops are engaging and enjoyable for the participants. Participants will also receive a copy of the latest “Leading High-Performance Team: Coaching in the Asian Culture” book co-authored by Laurence Tan and Chong Eng Neo.